Prizes for the 2019 Robot Tournaments are announced ! “We are delighted to announce an exciting new venture – indeed a new adventure – with the launch of Robot Tournaments with WBF Master Point Awards and titles under a new category described below (alongside Open, Women’s, Senior and Mixed). Robot tournaments are increasingly popular and we feel sure that by adding a new category of competition bridge scope and popularity will be further enhanced. Various companies (called Providers in this document) are licensed to run WBF Robot Tournaments (WRT). 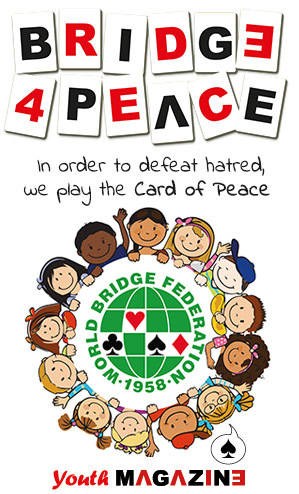 WBF Robot Bridge Point (WBFRBP) will be allocated at the time of play based on the number of participants and tournament boards. The data from the provider tournaments will be sent to a WBF Server, and combined with existing data to give an overall WBF ranking based on Robot Bridge Points. The top players of this overall ranking of Robot Bridge Points will, periodically, be awarded WBF Master Point in this new category. WBF Master Point totals will appear in a separate WBFRT Ranking with titles of World Robot Tournament Master and World International Robot Tournament Master, in the same way as ‘conventional’ bridge tournament awards. At the start of the WBF Master Point year (just after the WBF World Championships) the top 20 players will be awarded WBF Master Point in the main WBF Open Master Point rankings. The WBF will share net revenues derived from the Robot Tournaments with the Zonal Conferences and the NBOs. The respective shares will be based on the nationality of the players. The general idea is to split the net revenue on a 50/50 basis (50% to the WBF and 50% divided equally between the Zonal Conferences and the NBOs). Remaining credits at the end of each year will be transferred to the NBOs.